One of the nice things about the summer months in Oregon, is you are pretty well guaranteed great weather when you schedule a group ride. No one comes away disappointed. 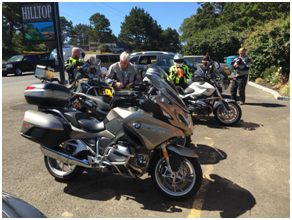 A group of 14 riders assembled at the appointed time at European Motorcycles of Western Oregon on August 6th for a first Saturday ride. Truly, this was the best turn out for a weekend group ride that we have had all season. Thank you for that. Upon leaving EMCWOR we headed west on Route 126 toward Florence. Keeping 14 riders together in a group (I reminded myself) is a futile effort. I made one quick stop in Walton to see if we could reassemble, but it was not to be. It was at this point that I reminded myself that I was thankful that I had remembered to post the mid-ride lunch stop on the club calendar. Once in Florence, we turned northward to pick up another rider, and continued on up the coast. There was a definite costal chill in the air, but the scenery was so nice that honestly I don’t think anyone minded. 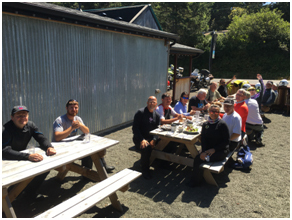 Our lunch stop was at the always-good Hilltop Café & Bistro just south of Waldport. I have never been disappointed in the food I have had at the Hilltop. I called ahead and Courtney was happy to reserve a few tables on the patio for us. It is at this point in the ride report I should mention everyone by name. Sorry, that is not going to happen. Why? Although I dutifully had every one write their names on the back of two business cards, they promptly found their way to the lint collector in our wash machine. Sorry all! Well, you know who you were. 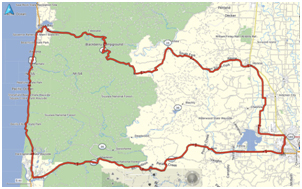 The return trip took up through the Lobster Valley and then to Alsea Falls along the Alsea Scenic Highway to the crossroads town of Alpine and then on to Eugene. A few months ago the Lobster Valley was touted as one of the top 5 paved rides in NW Oregon, by SoundRider.com, to add to your bucket list. I certainly don’t disagree with their assessment. While the road is in a fair state of repair, watch out, there are more than a few blind corners.